Don't imprison your goldfish or Bettas in a boring old fish bowl, give them a modern upgrade in this cool new Umbra FishHotel. 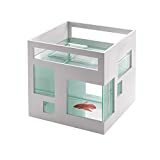 This stylish little condo-inspired aquarium features a stackable design and is perfect for a space-limited office or home. This unique glass fishbowl features a sleek white outer plastic shell with assymetrical windows and the inner bowl is removable for cleaning.